Island Mommy Living: What would you call your Scrap Style? What would you call your Scrap Style? Lately, I've been applying for a few different design teams. And usually, on of the questions in the application is, "what is your style?". At first I struggled with this question because I've only been scrapbooking for a few years. I learned from youtube process video, particularly Shimelle Laine. From there I started scrap lifting layout I found online so I could practice different styles and techniques. About a year ago, I developed my own style. One word that comes to mind when describing my style: Layered. I do love tons of white space on my layouts. To me, it draws more attention to the photo. What would you call your scrappy style? Ah Andrea I love your style and yes I would say layered with lots of white space and it is a style that really appeals to me ... I seem to be a bit all over the place at the moment... ADHD or something... I have the attention span of a goldfish and I flit from thing to thing... 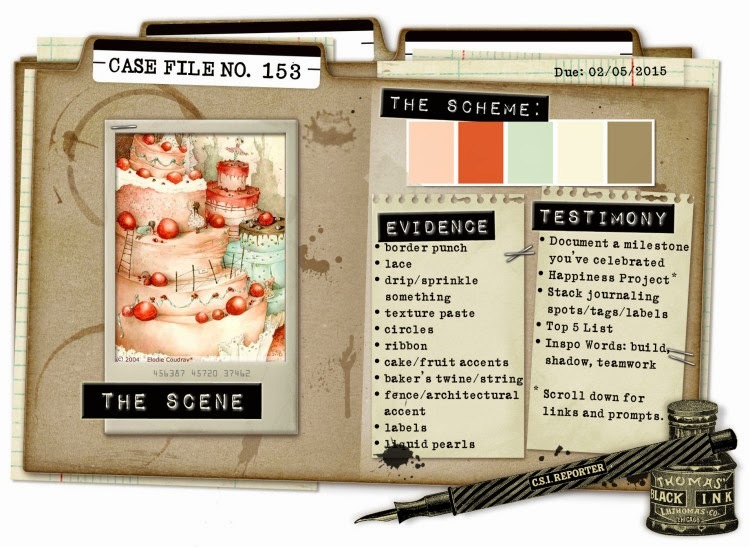 I love the CSI case files... they kind of ground me and get me focussed a bit... Love your take on the challenge. Will leave you some love in the gallery. This is a stunning layout. Oh my goodness, he is just a doll! I love those photos and I bet it was teamwork lol I love your style - the layering is really neat. Great take on the challenge!